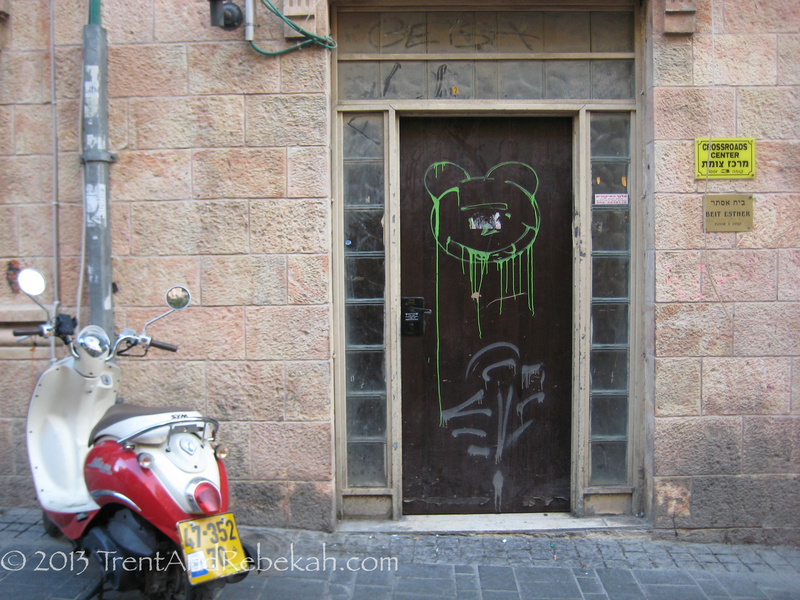 When you walk around Jerusalem, there are lots of things you expect to see. 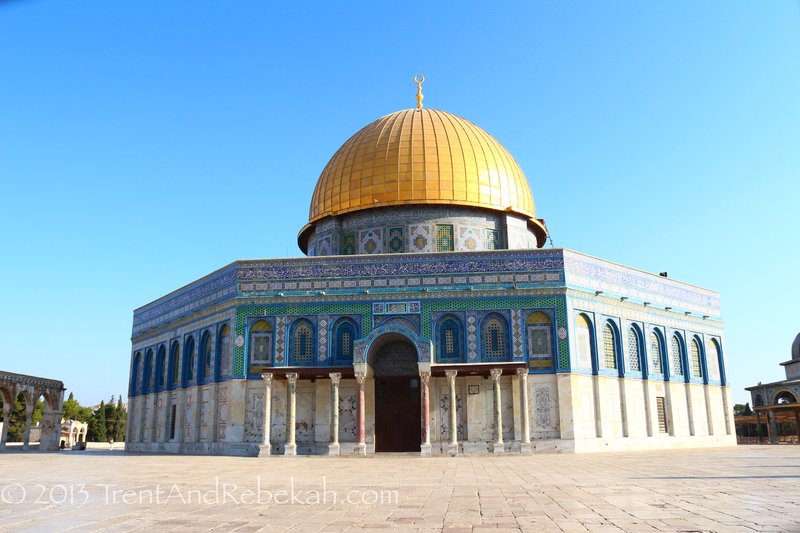 Cathedrals, cats, pilgrims, and mosques—minarets, cramped markets, and fantastic costumes. However, it’s the things that you don’t expect that either escape your notice altogether, or remain indelibly stamped on your psyche forever. 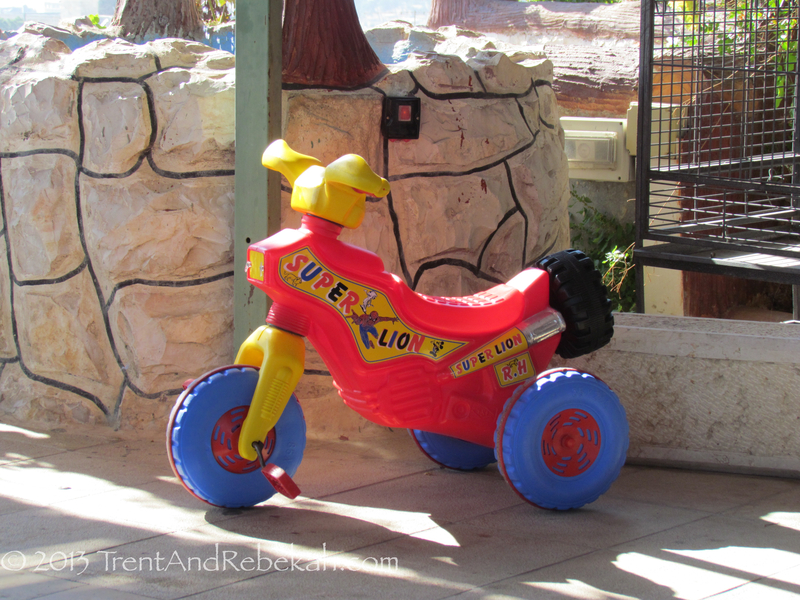 We saw this cute three-wheeler on the hotel roof, but what Spider Man, Mickey Mouse, and Super Lion have to do with one another evades us at the moment. Spiderman, Mickey, and Super Lion–An Unstoppable Team! I’m mildly suspicious of a restaurant that claims an authentic Mexican experience, when they misspell the Spanish words. 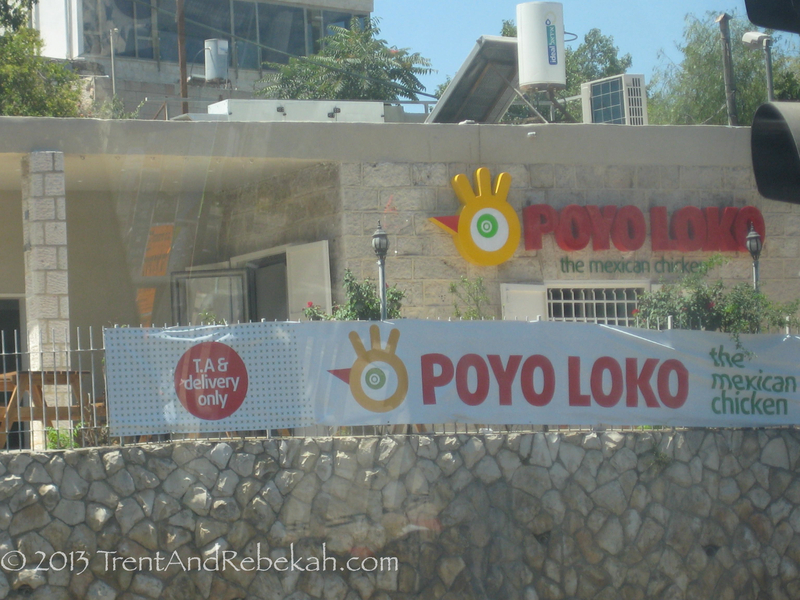 Not to be mistaken for Pollo Loco. Who doesn’t fancy a spot of cake? Especially when it’s English! I would try it, but for fear of crushing disappointment if it turned out to not be delicious cake. 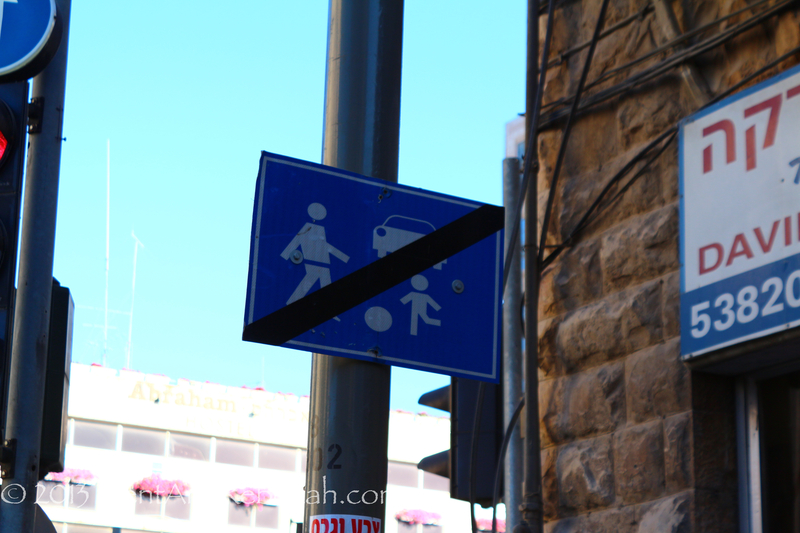 I never expected that one would have to be told this on a crowded, traffic-laden thoroughfare. I’m sure there’s a story behind it, though. Seriously, don’t play soccer in traffic. We should probably eat here so that our submersion into the culture will be complete. What kind of music do they play in there? 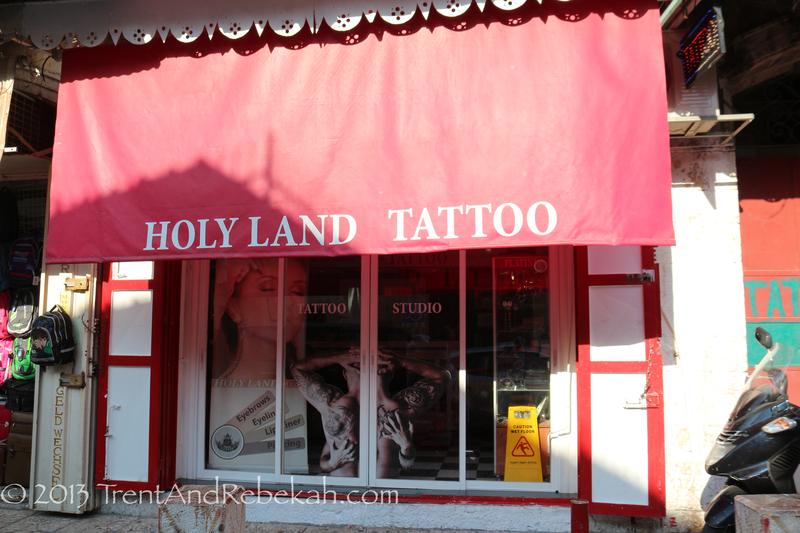 Mamma never wanted you to get a tattoo, but how could she say “No” to one that’s from the Holy Land parlor? How could this not end well? We really have nothing to add to this one. Checking out the local artwork is always a unique cultural experience. 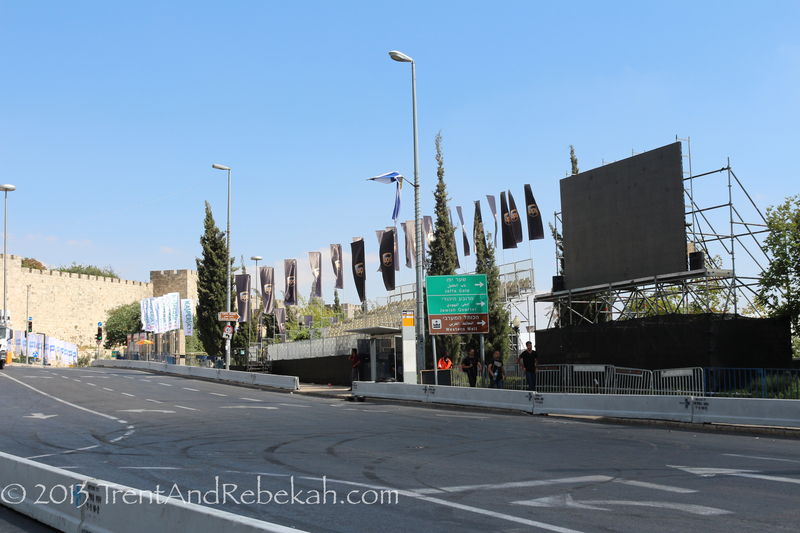 Jerusalem was celebrating its Formula 1 race. 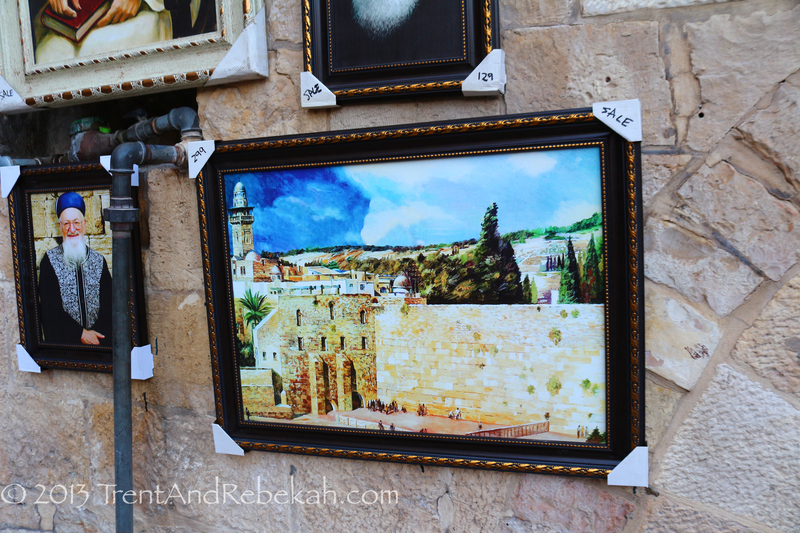 We saw this painting of the Western Wall, and then realized something important was missing from the cityscape. 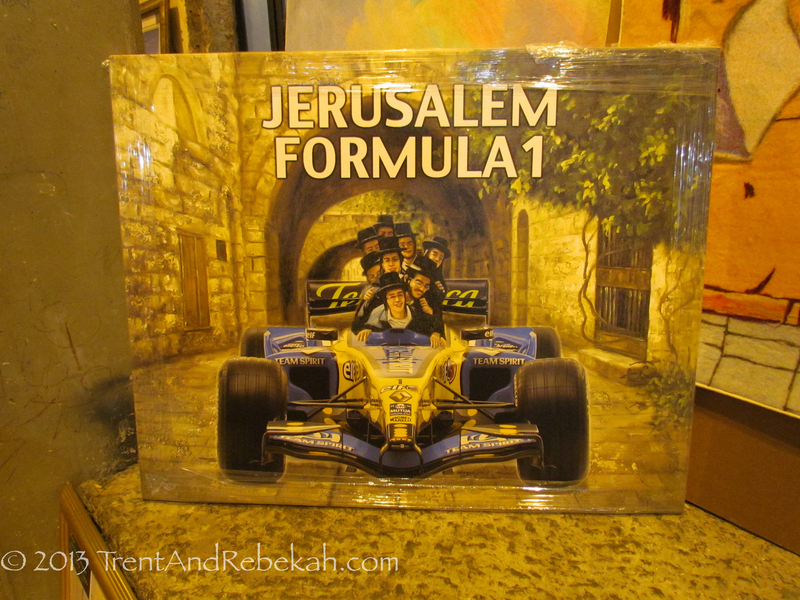 While we’re at it, we never thought we’d run into Formula 1 racing in Jerusalem at all. 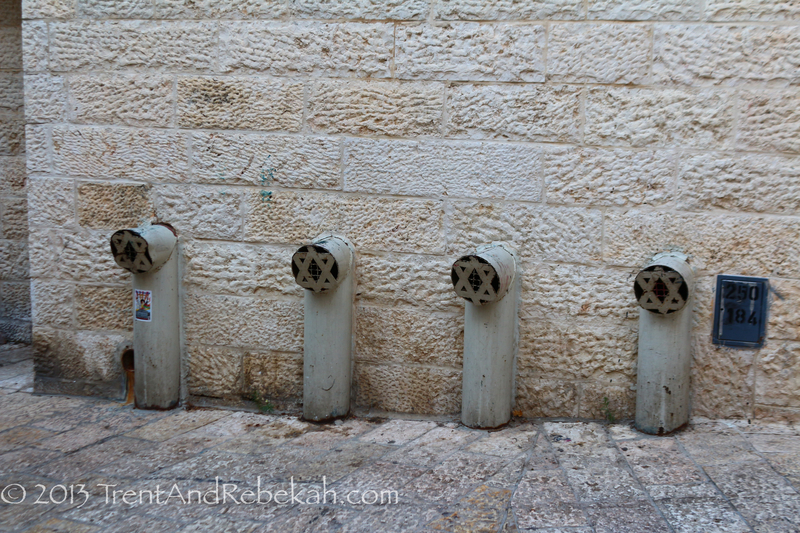 Some of the vents are custom made in the Jewish Quarter. The cats run the gamut—from sleek fat cats to ragged scrappers. Some are just more photogenic than others. And, last, but not least, we’d like to take this opportunity to commemorate the moment our trip took a turn for the horrific. 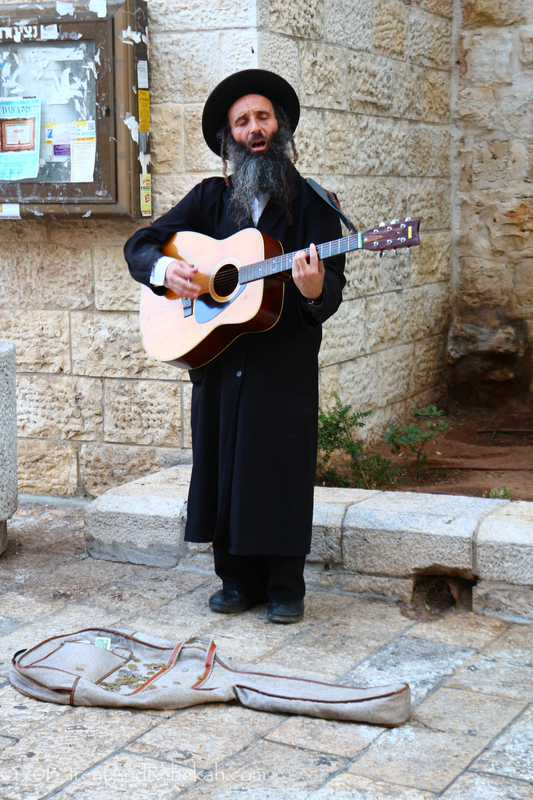 We first ran into this guy in Tiberias in September 2012. 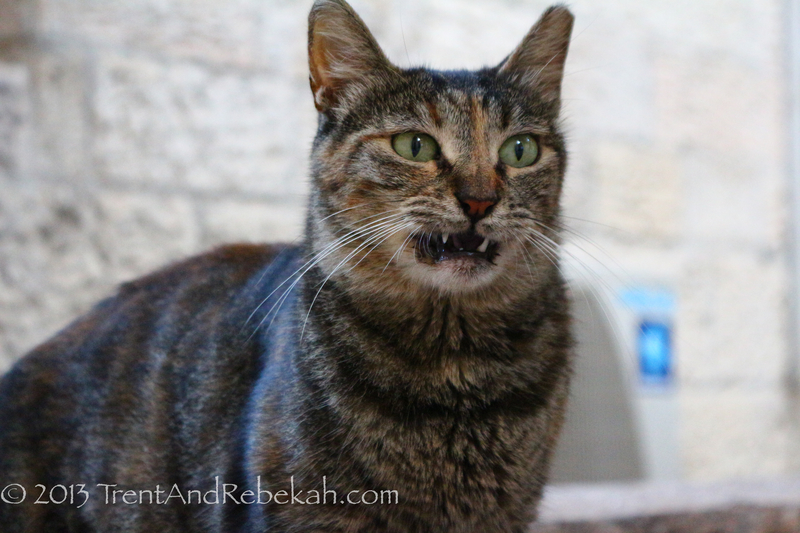 About 10 days later, we saw him again near Lachish. Yesterday, we turned the corner around the hotel, and there he was, staring into our souls. Have you ever stood in a location and thought to yourself, “Wow, I could totally hide an army here!” or “This place would be SO easy to defend!”? But if you did, you would know there are several things to consider when one is choosing a militaristic abode—especially if you 1) are on the run, 2) will ever have a longing for food or water, 3) need a defensible position, or 4) need to house an army, be it domestic or military. Many of the men (and a notable woman or two) of the Bible were of a marshal disposition. 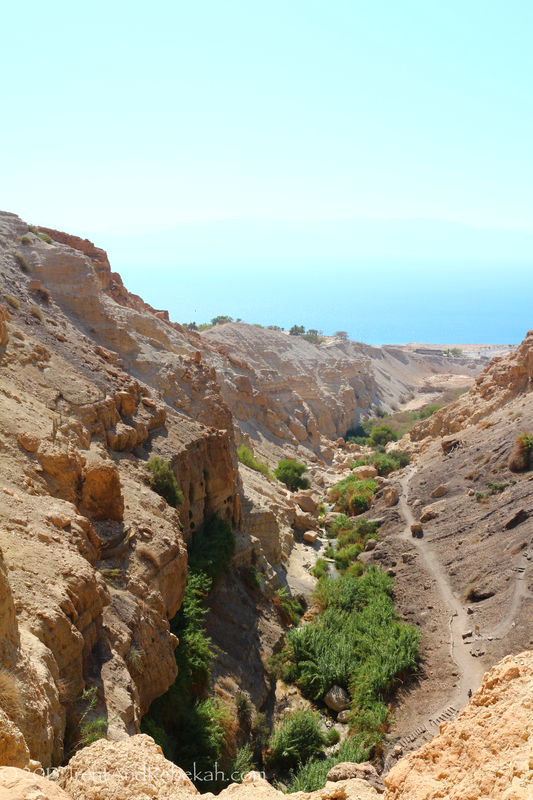 It’s an intriguing exercise to try to look at the places they have been through their eyes, and few places are easier than in the Judaean Wilderness. 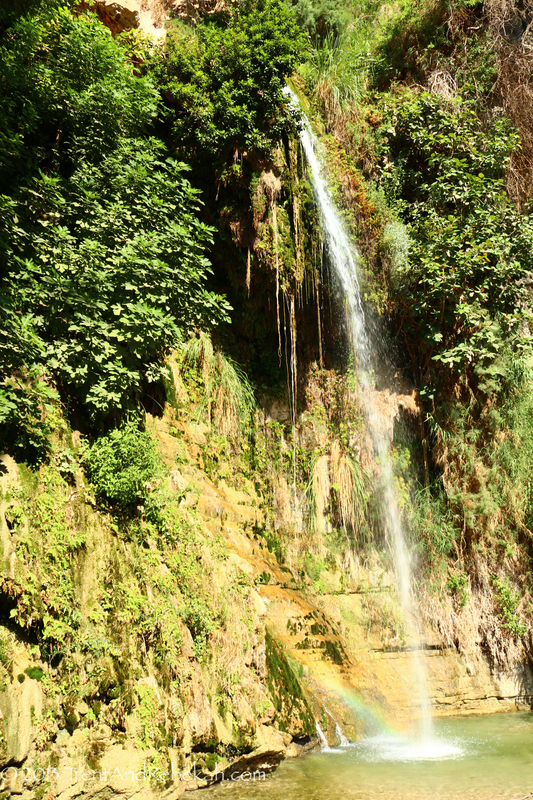 Ein Gedi (lit. “Kid Spring”) has been used since roughly around the time man figured out how to stack one rock on top of another. So why did David possibly wend his way here to escape Saul? Much like the famous canyons of our own Wild West, an entire army could lie hidden within this expansive fold in the Judaean Wilderness. Rebel soldiers and kings alike could relax among the many caves and waterfalls this exquisite oasis provides—all while taking advantage of the edible wildlife and surrounding agricultural communities. 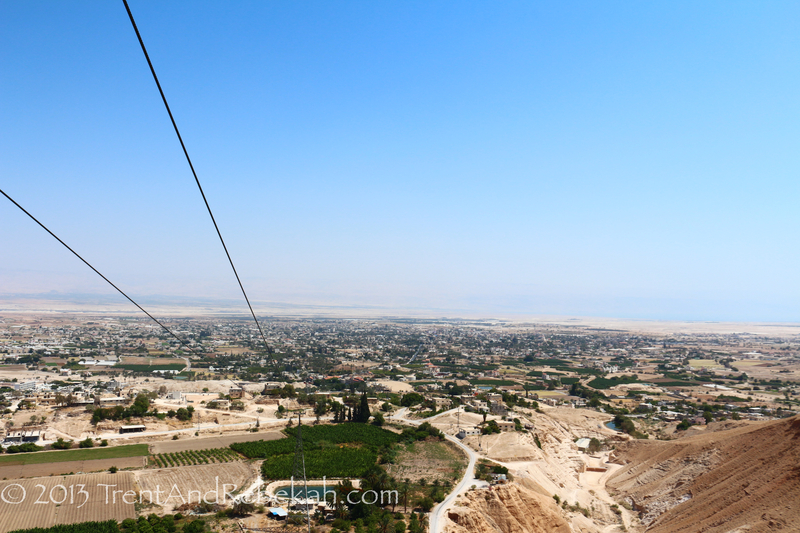 Defensively, a network of lookout stations would have a direct line of sight from the lofty Shulammit Spring to distant mesas, such as Masada. Offensively, a mere pittance of soldiers could defend the narrow entrances to the wadi. Which brings us to Masada. 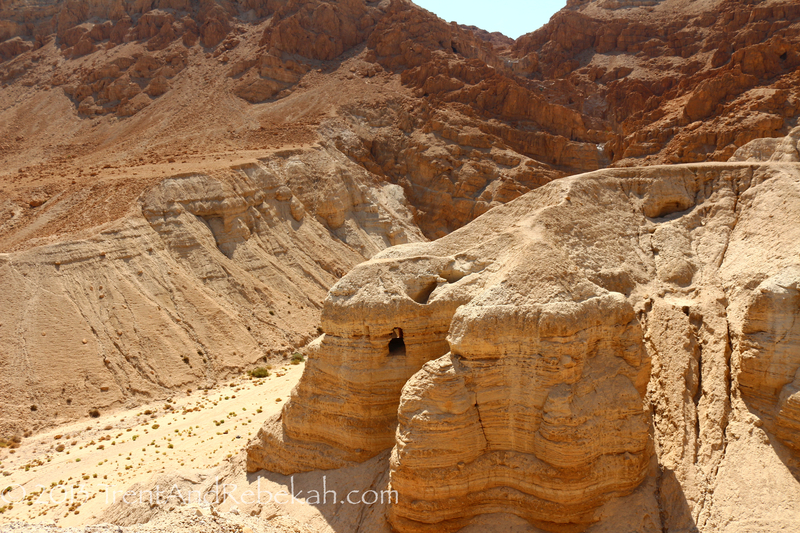 Some scholars consider this a viable location for one of David’s desert strongholds. Mentioned especially in I Samuel 22:4, he could have easily passed to Moab from the lisan of the Dead Sea and back to his matsuwd (Heb. “stronghold”). How well Masada and the wilderness proved to be in the defense department is even more evident as Herod the Great rose to power. 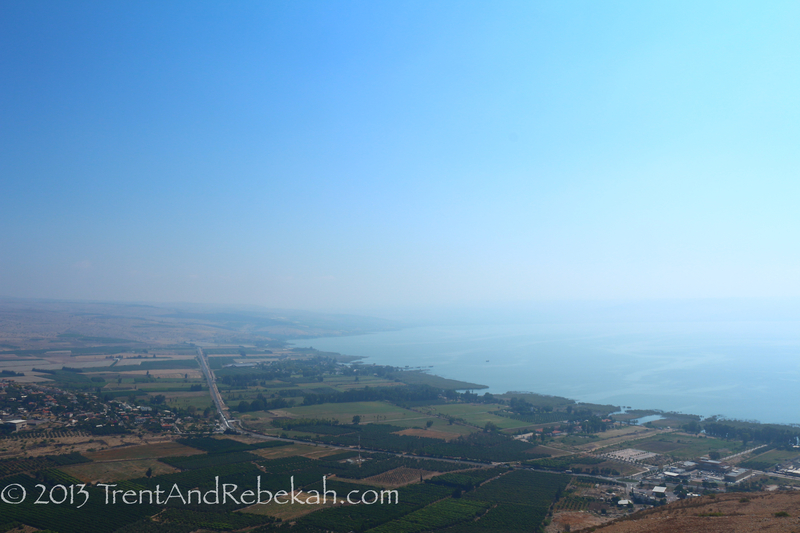 Fearful of his safety, he built (and rebuilt) many fortresses on both sides of the Jordan River, including Herodium, Masada, and Machaerus. Signals from these fortified palaces could be seen from miles around—and any approaching enemy would be spotted from the lofty plateaus. 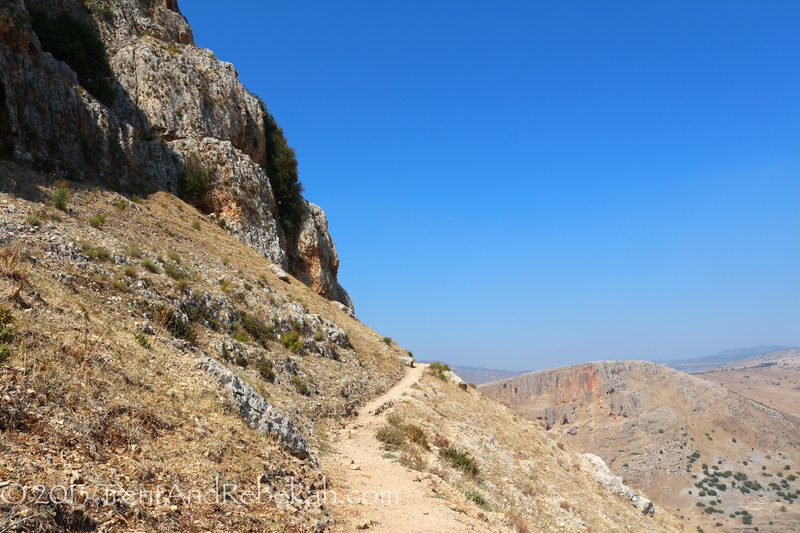 One man alone could each have held the tiny paths leading up the mountain. Unfortunately, this made these palatial fortifications rather easy to besiege, as the fewer the entrances, the fewer the exits to guard. 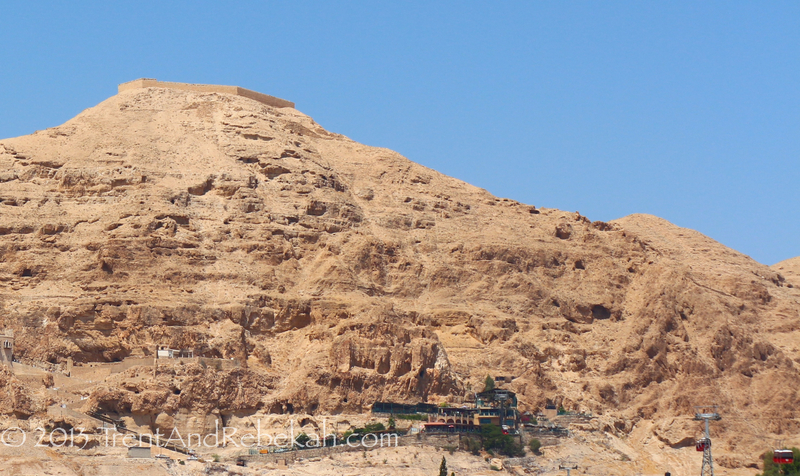 Masada was easy to defend, and thus easy to besiege. We’ve continued our tour of the country, moved north to south, and now we have begun our central campaign. 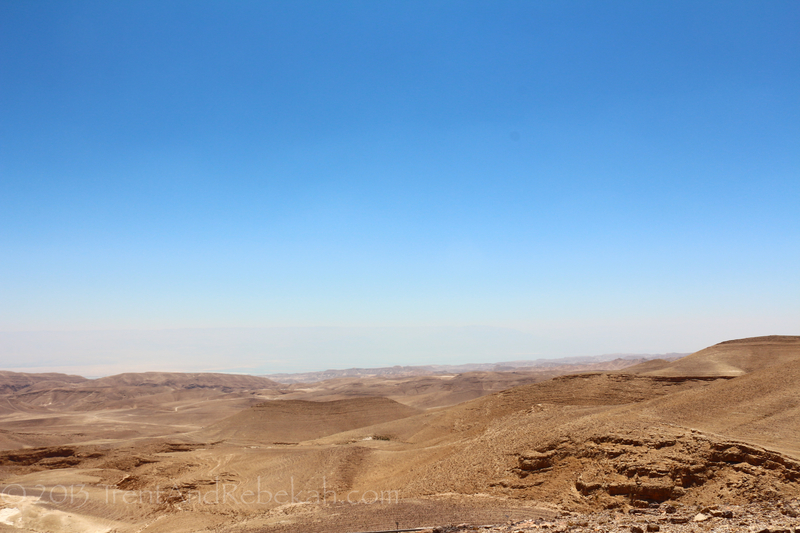 The Negev is the desert region in Southern Israel, extending down to the Gulf of Aqaba. It is a beautiful region, with deserts and makhteshim—the “craters” caused by soft mineral eroding from beneath harder rock, causing the upper layer to collapse. 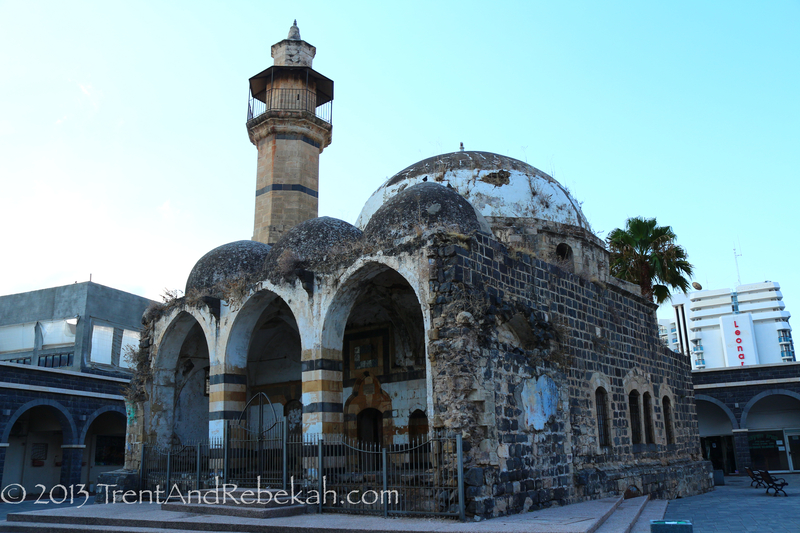 Originally built in the Bronze Age, Arad is one of those cities in Israel that has always been there. 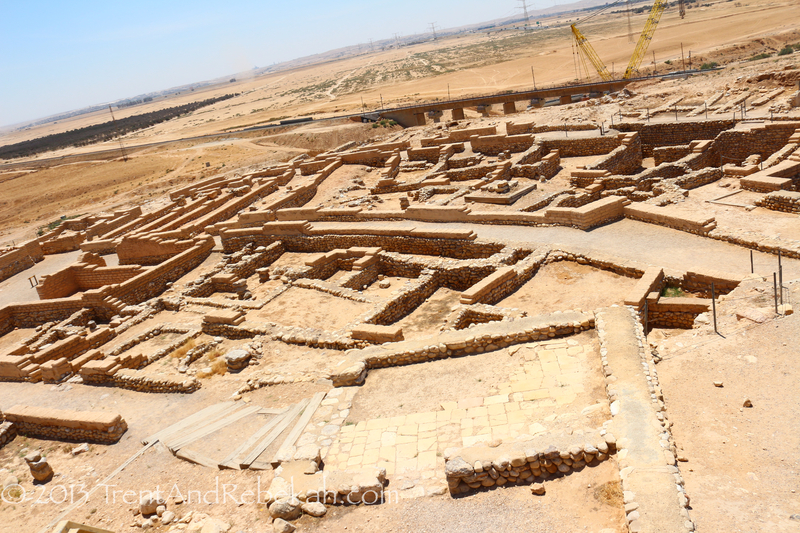 The lower city excavations are Canaanite, featuring dwellings and palaces. 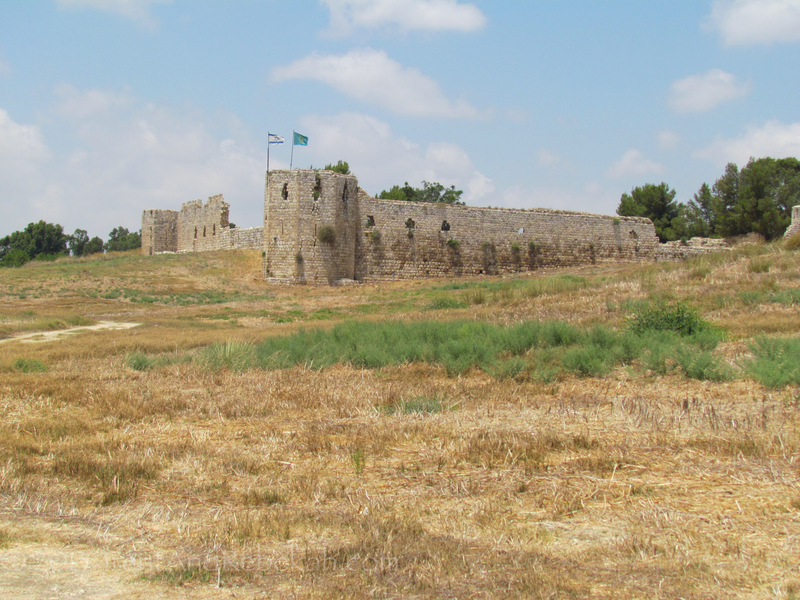 The upper are mostly of Israelite origin, with a Hellenistic tower built in the middle of the fortifications. 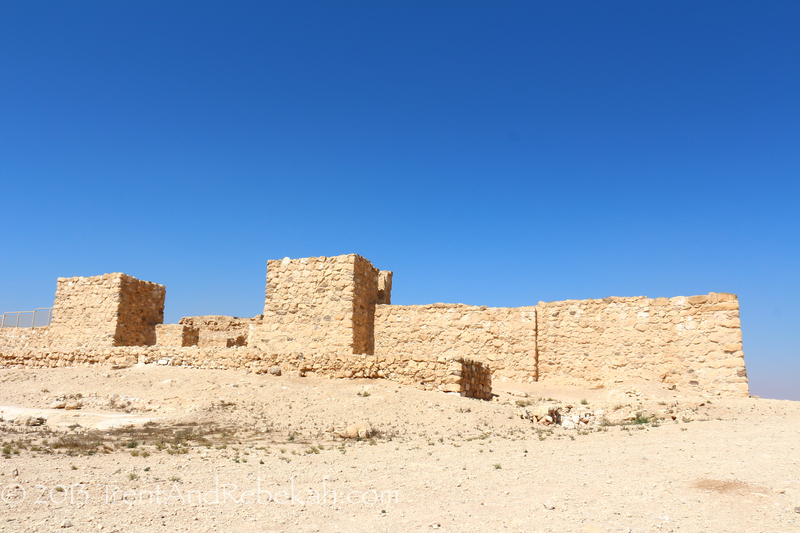 Beersheba is a oft-mentioned city in the Bible, from Abraham’s covenant with Abimelech to describing Israel’s territory as reaching from “Dan to Beersheba.” The tell itself commands a fabulous view of the surrounding country, which was necessary for the embattled city to defend itself. 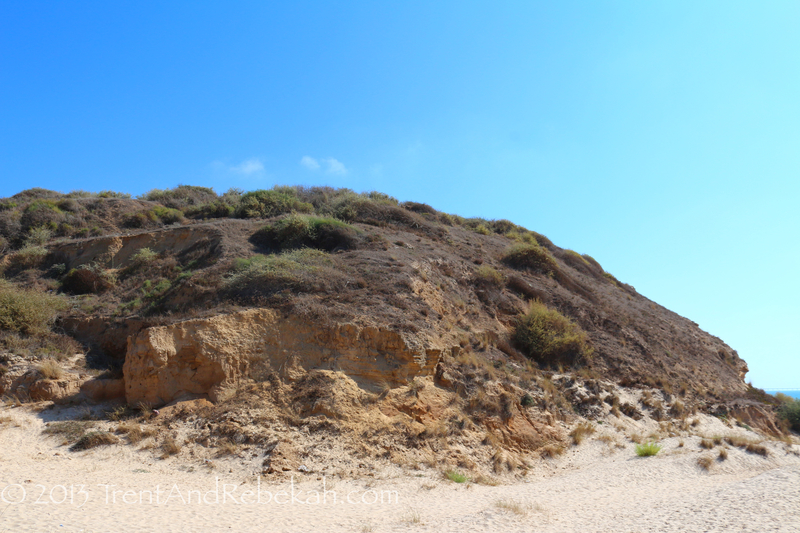 A tell that is near and dear to our hearts, we returned to take a few photographs and recall an ancient site that is best known as one of the Philistine pentapolis. 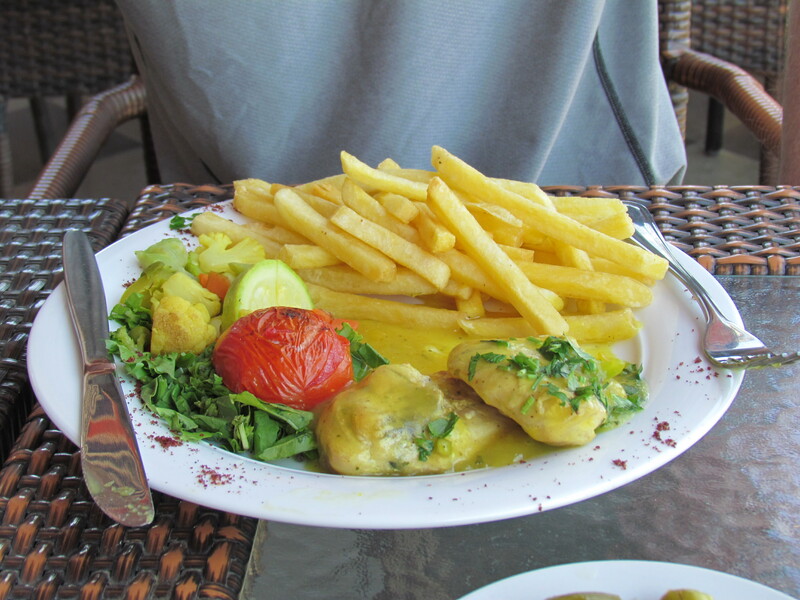 Throughout its long history, this city has been an important port town, and is well known for its wine and oil. 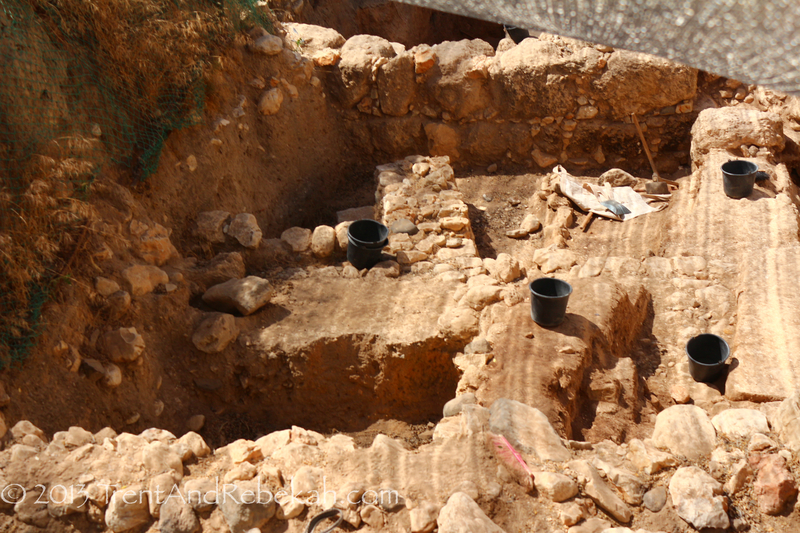 Another member of the pentapolis, and now a cow pasture, Ashdod was the original resting place of the Ark of the Covenant after its capture by the Philistines. They learned a rather uncomfortable lesson from that incident, and hastily sent it home. It is also described as participating in sea-trade, due to its control of a port 4 miles away from the land-locked city. 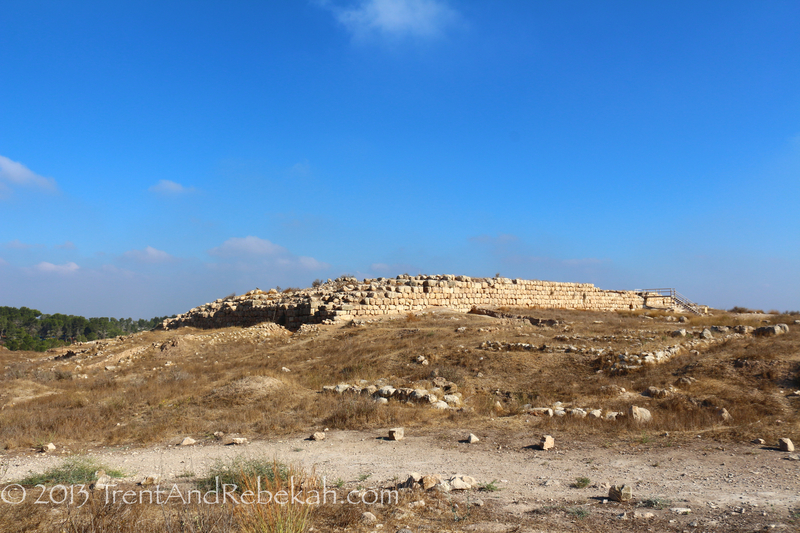 Lachish is an old favorite. 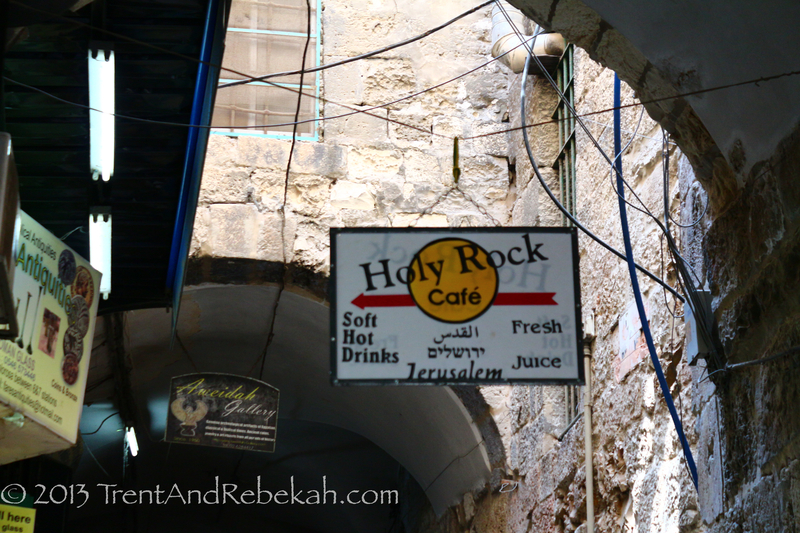 As a city that was old before the Israelites conquered it, it came under control of Judah, and was established as a fortified city by Rehoboam, the final defense before an enemy could reach Jerusalem. It acted its part during the siege of Sennacharib, who destroyed the city and publicized the event through a series of reliefs in Nineveh. 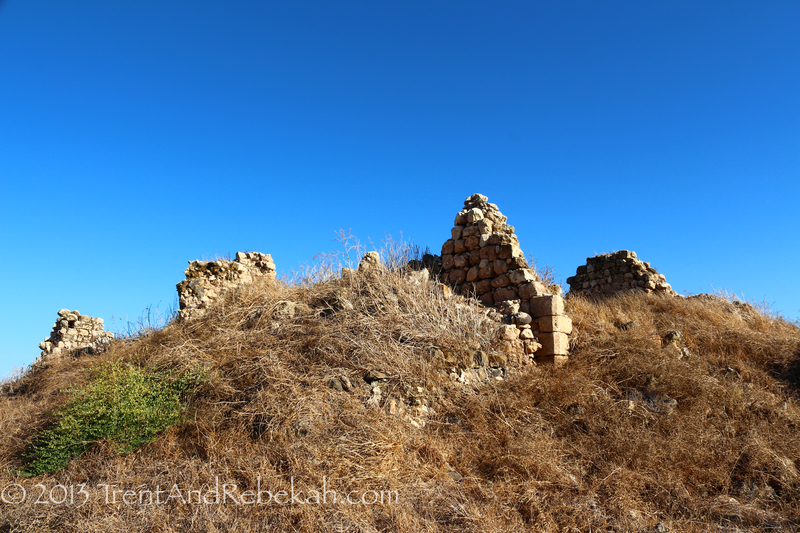 Another of Rehoboam’s fortified cities, Mareshah was the site of a battle between King Asa of Judah and Zerah the Ethiopian. However, the city was taken by the Edomites after Judah’s fall to Babylon, and remained a vibrant city until it rotted away under the Hasmoneans. 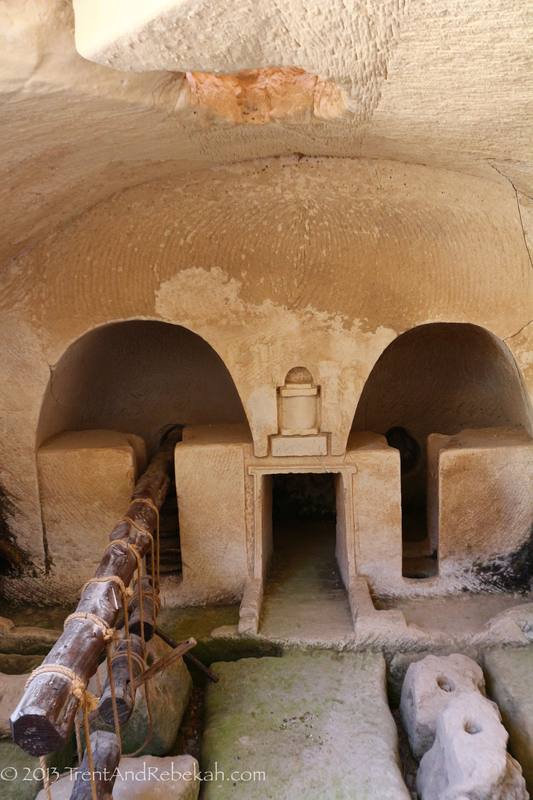 Today, visitors can explore many of the incredible caves under the city, including subterranean olive presses. 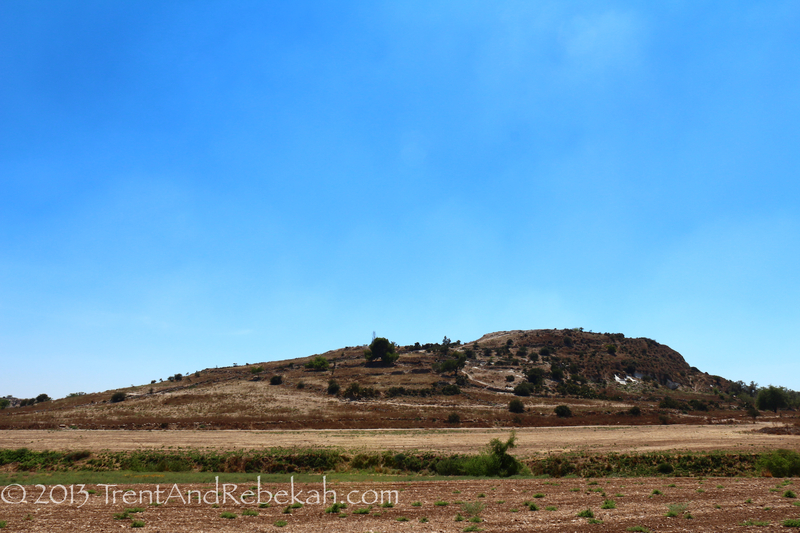 Positioned in the Elah valley, near Khirbet Qeiyafa, Socoh hosted the Philistines as they drew themselves up in battle array before the Israelite encampment at Qeiyafa. It was between these tells that David and Goliath had their famous “match,” and then the Philistines were pursued up the valley as they fled the wrath of their conquerors. 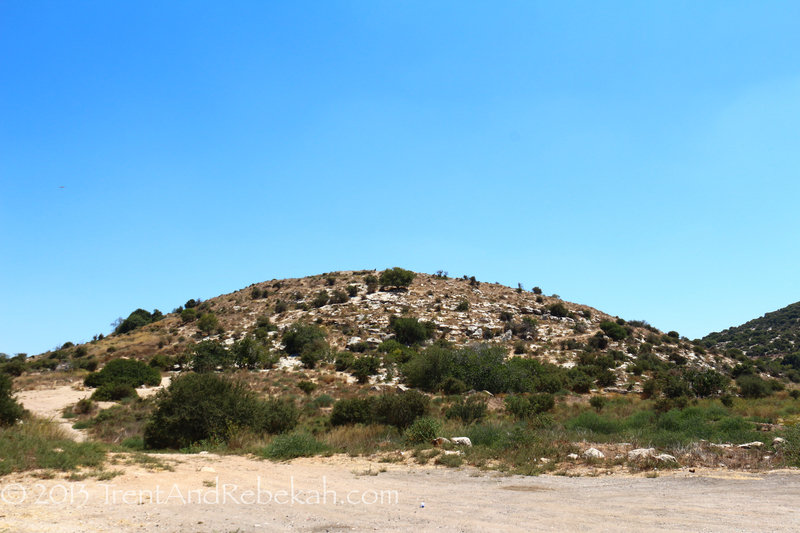 Speaking of Goliath, number 3 in our tour of the pentapolis was Tel es-Safi, commonly identified as Goliath’s hometown of Gath. 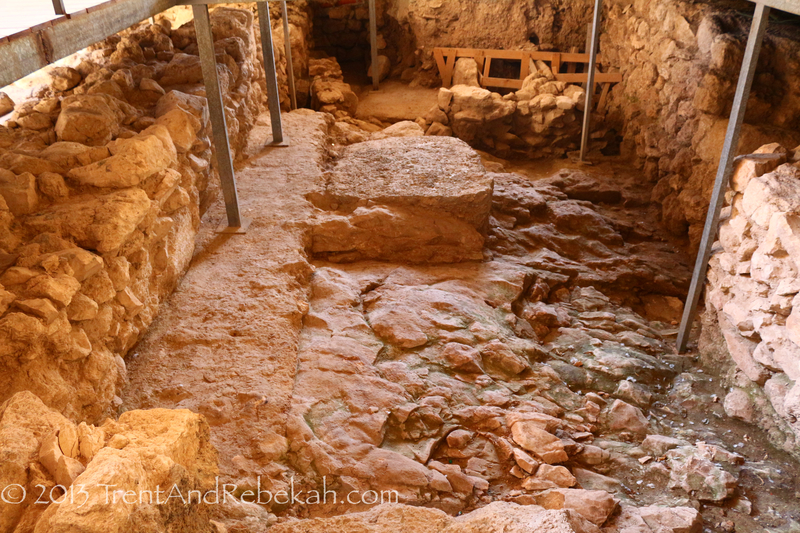 It is a unique irony to note that the Brook of Elah runs along the foot of the tell—a ways downstream, it betrayed the giant by yielding a smooth stone to a young shepherd. 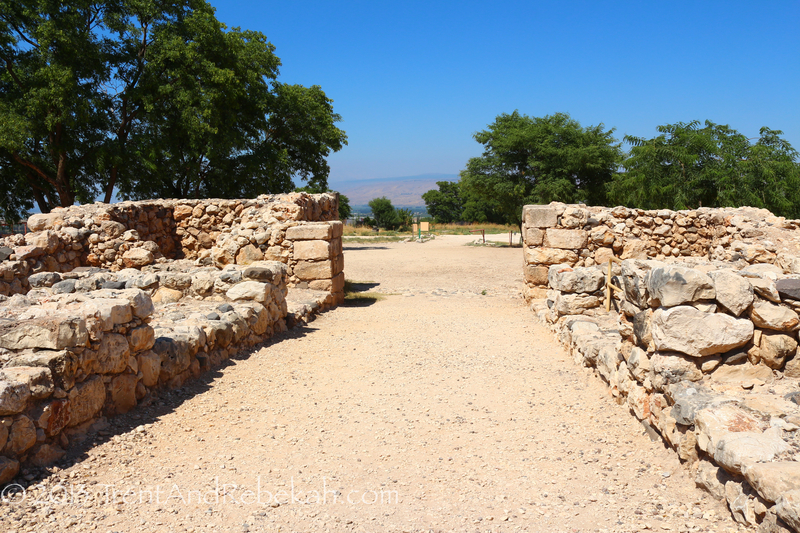 The ancient city of Bet She’an (Beit Shean, Beth Shean, Beth Shan, Bethshean, etc.) first appears in the Biblical narrative during the period of conquest, when the city was given to Manasseh as part of her territory. 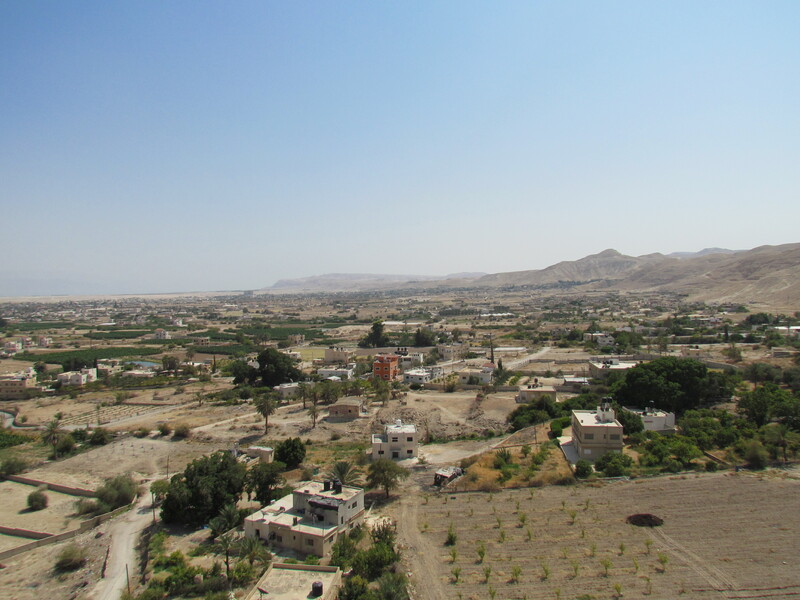 The tell is beautifully strategic, located at the junction of the Jezreel and Jordan Valleys and commanding a fantastic view of the surrounding countryside. However, Manasseh allowed this fortress city to slip through her fingers due to the iron chariots of the Canaanite inhabitants. 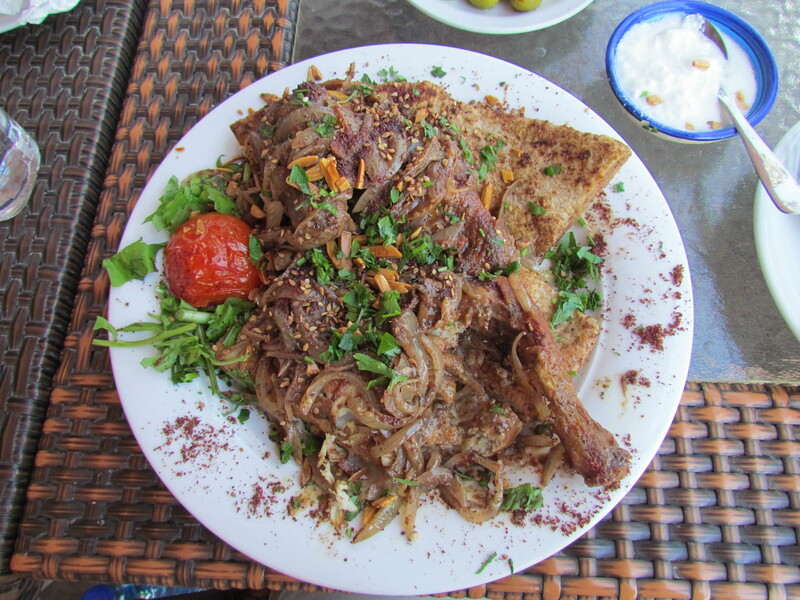 What Manasseh gave up, the Philistines were happy to take. In I Samuel 29, the Philistines gear up at Aphek for another row with the Israelites. This is where they rather irritably sent David, their supposed ally, away. 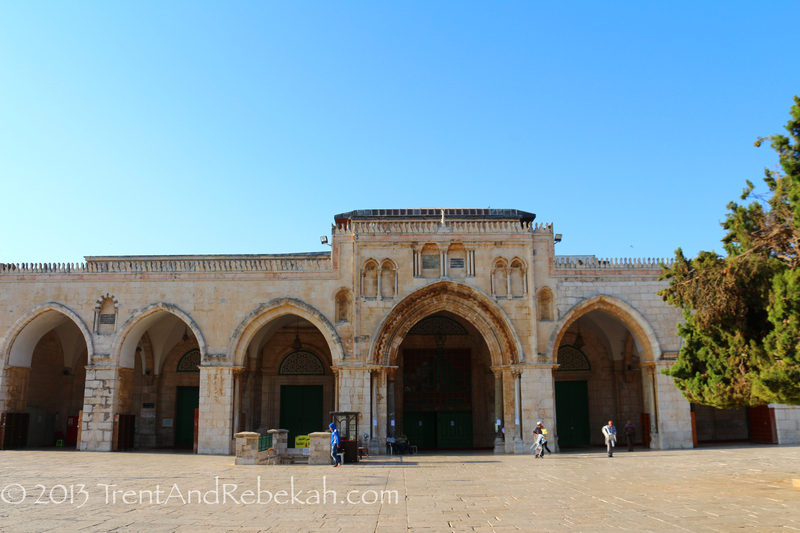 The battle against Israel was brutal, and, in I Samuel 31, the royal family falls at Mt. Gilboa. 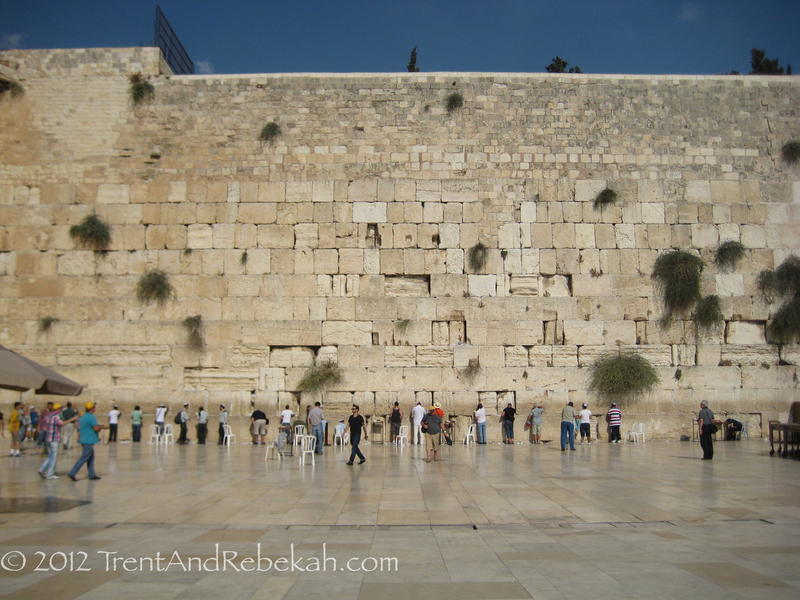 In triumph, the Philistines hang the headless bodies of Saul, Jonathan, and the rest on the fortress walls at Beth Shan. 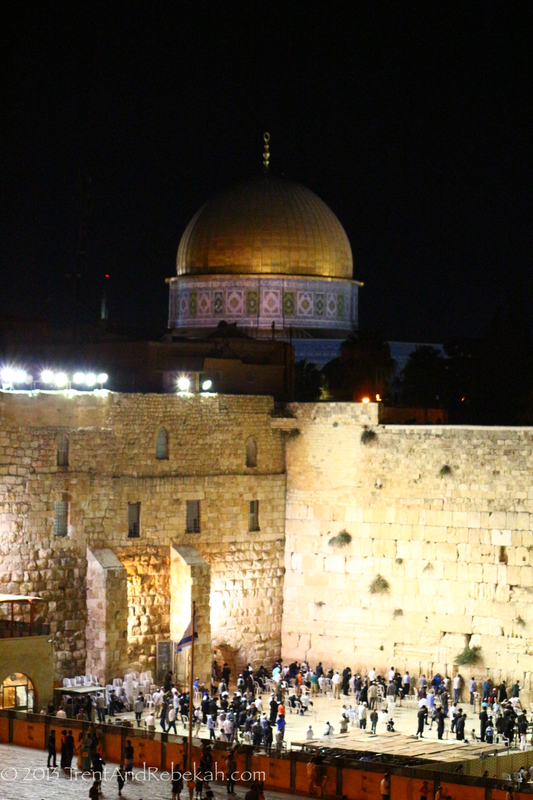 The men of Jabesh Gilead recalled Saul’s kindness and removed the bodies in the night—a valiant deed, as they covered miles of open territory and scaled the side of a fortified and guarded city. 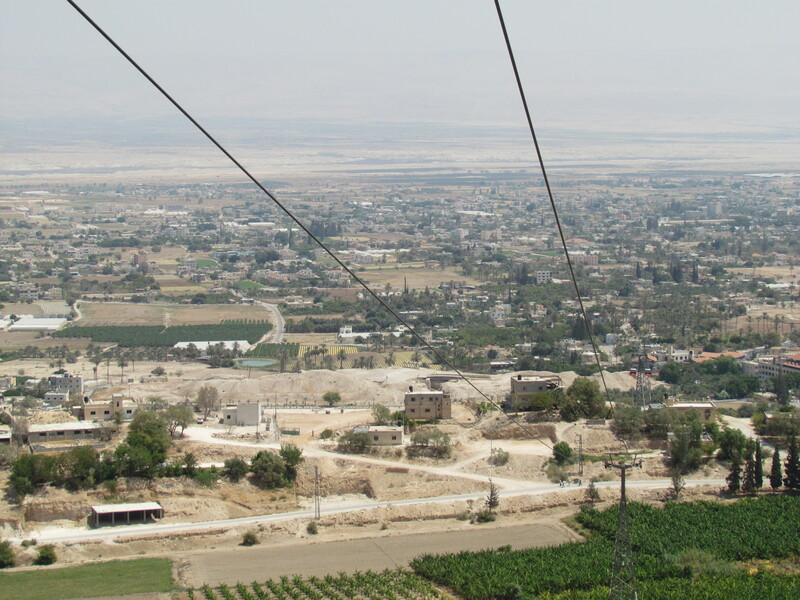 David would go on to take Beth Shean and Solomon would place the city under the administration of Baana. 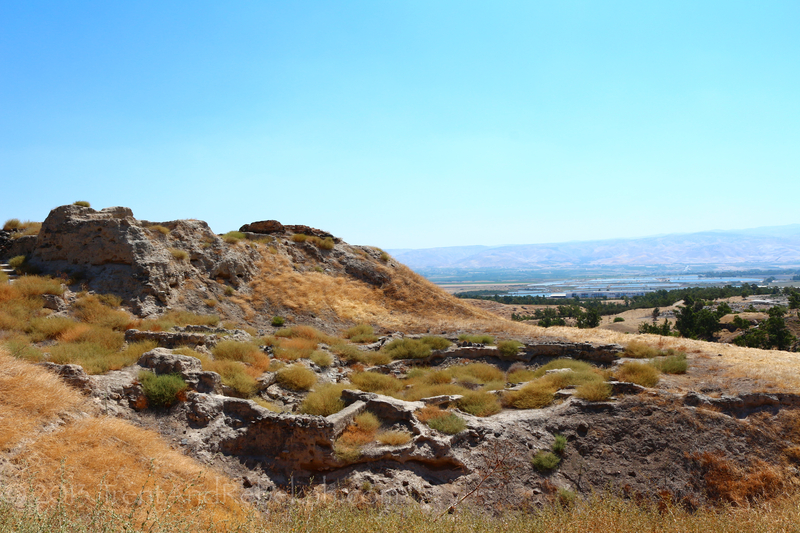 Time passed, and Beth Shean eventually came under the control of Alexander the Great, who settled his garrison of Scythians here, thus changing its name to Scythopolis. The city would later be caught in the crossfire between the Ptolemies and Seleucids, and Josephus gives the account that High Priest Jonathan was kidnapped there and later murdered—one of the events leading to the Maccabean Revolt. 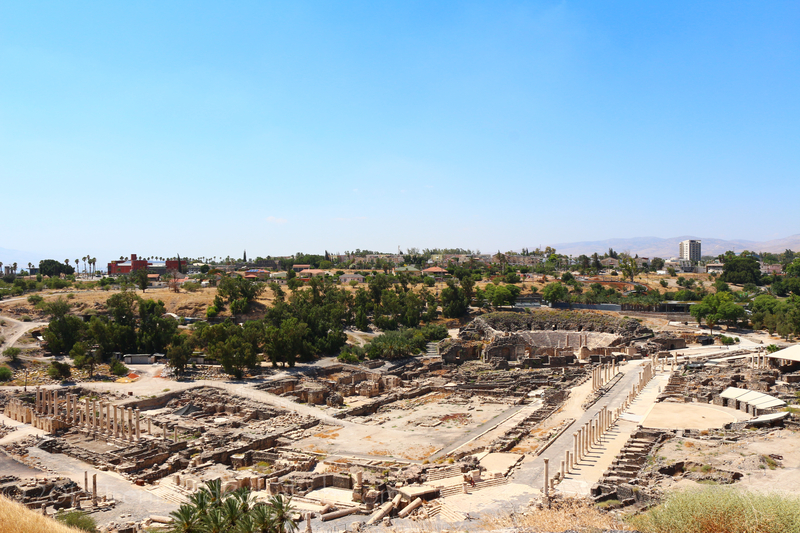 In 63 BC, Pompey gathered Beth Shean under his wings as a city of the Decapolis. It was beautified, with theaters, amphitheaters, a cardo, bathhouses, and a rather nice public toilet. 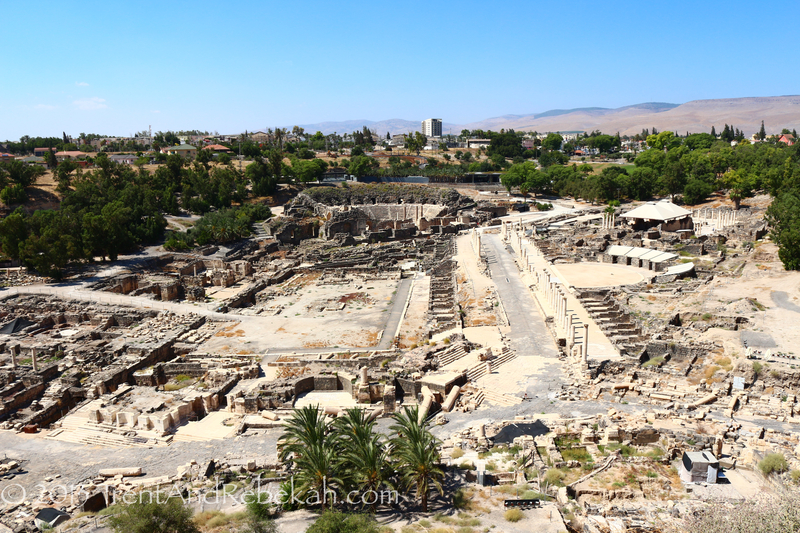 Beth Shean was never really abandoned over the millennia, though the site of many a bloody conflict, even through the 21st century. 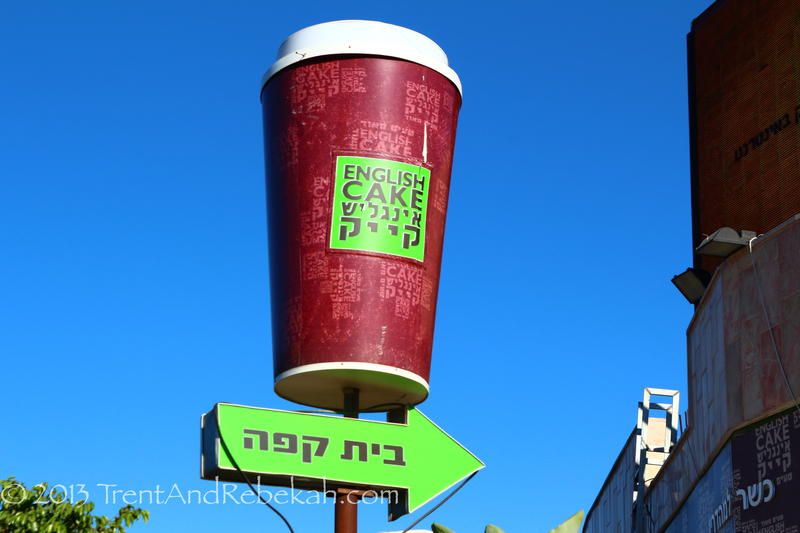 Today, the tell can still be seen for miles around, just south of the Spring of Harod. 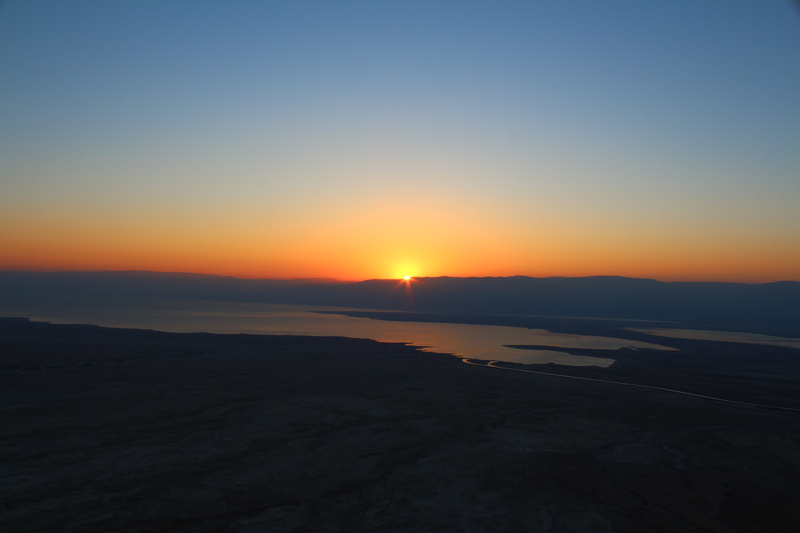 View of the sunrise from Masada, Herod’s ancient fortress. 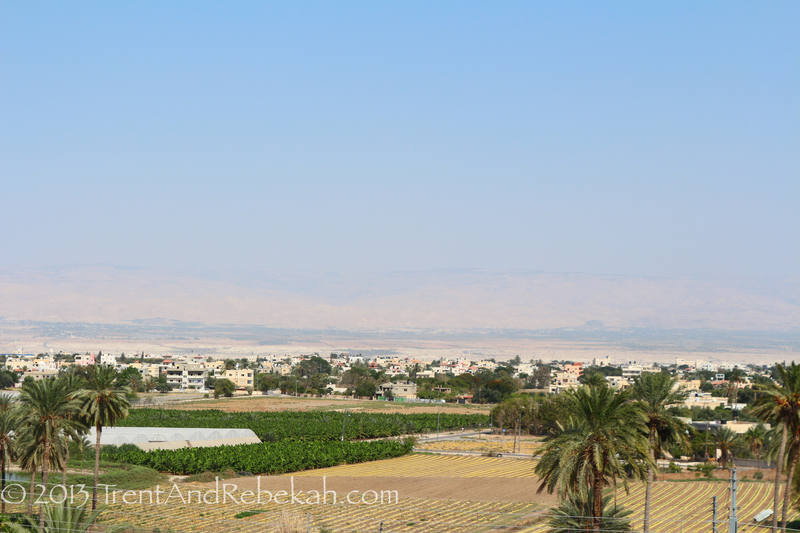 It is rising over the mountains of modern-day Jordan and the Dead Sea. Photo shot about 9 hours ago. 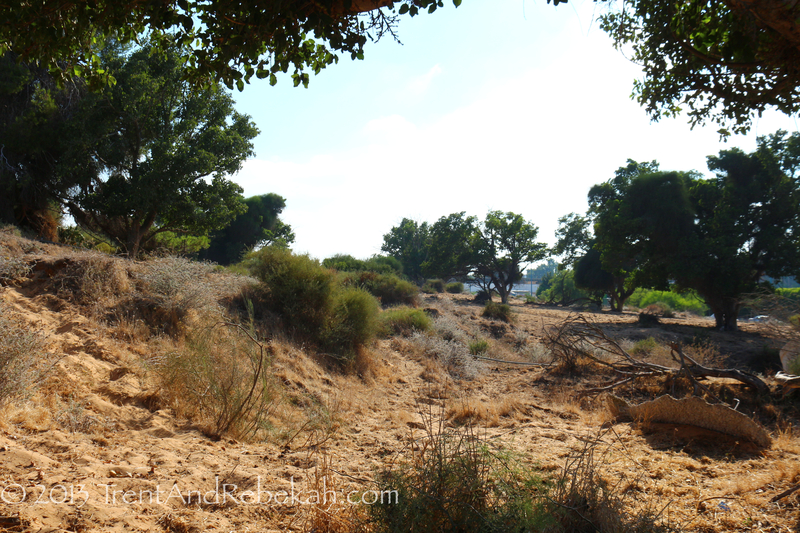 The other day, we spent a bit of time at Tel Afek, the site of…Aphek, also called Antipatris. 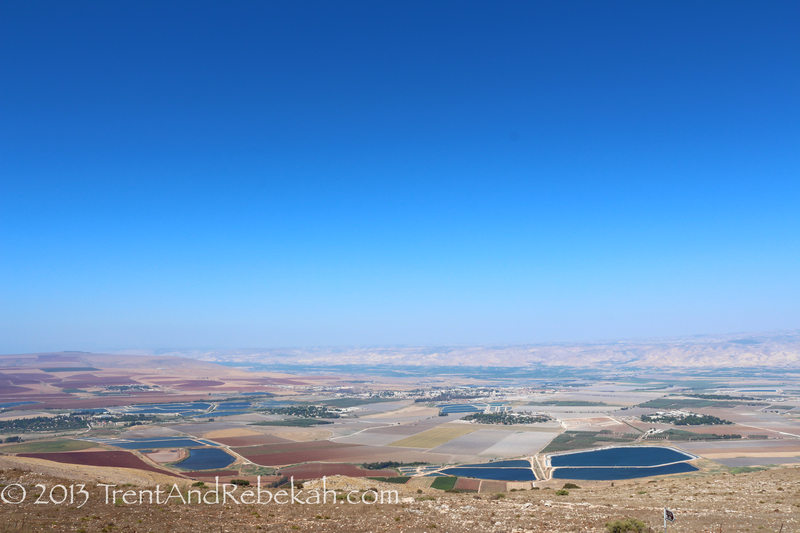 Biblically, we first see Aphek as one of the cities taken by the conquest and given to the tribe of Asher. By this time, it was already old, having been controlled by Egypt for quite some time. In I Samuel 4, the Philistines were encamped at Aphek when they routed Israel’s army and took the Ark of the Covenant as spoil. Despite the fact that that incident ended rather unpleasantly for them, they again set up base there to fight the Israelites–though, for some reason, the princes of the Philistines protested against David’s presence in their army. 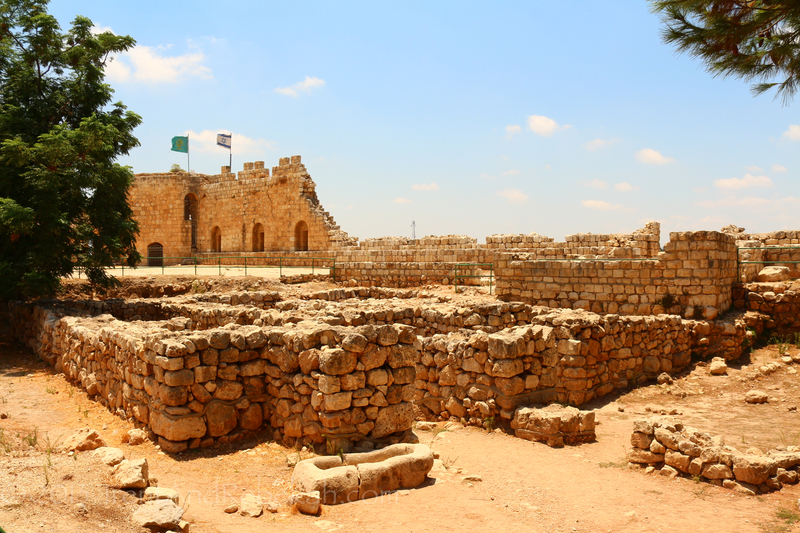 History tells us that Herod would eventually receive Aphek as part of his kingdom, which he expanded, adding a Roman forum and cardo through the city. He renamed it Antipatris, after his father. It was thus to ancient Aphek that the chief Roman captain of the Antonia, Claudias Lysias, spirited Paul away when the Jews made their assassination plot against him (Acts 23). But why was Aphek so hotly contested? 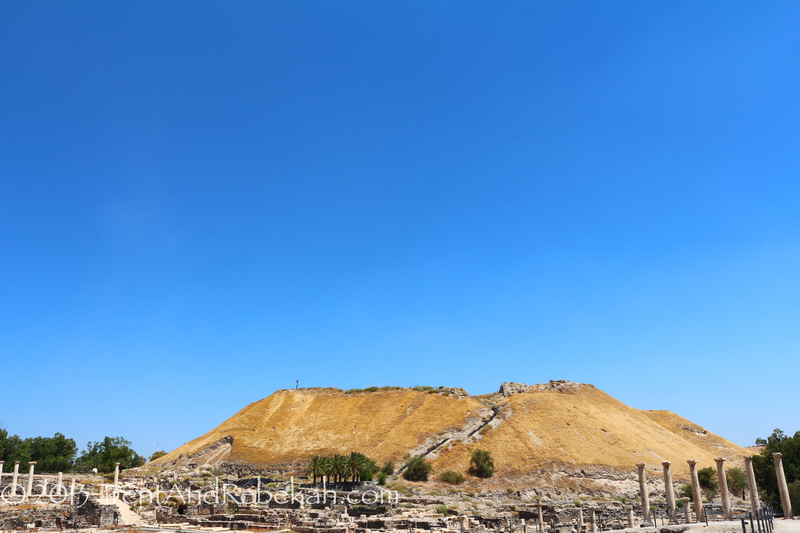 From its foundation in the Chalcolithic Period (4500-3000 BC) to the Ottoman empire, it is clear why it was a popular piece of real estate. 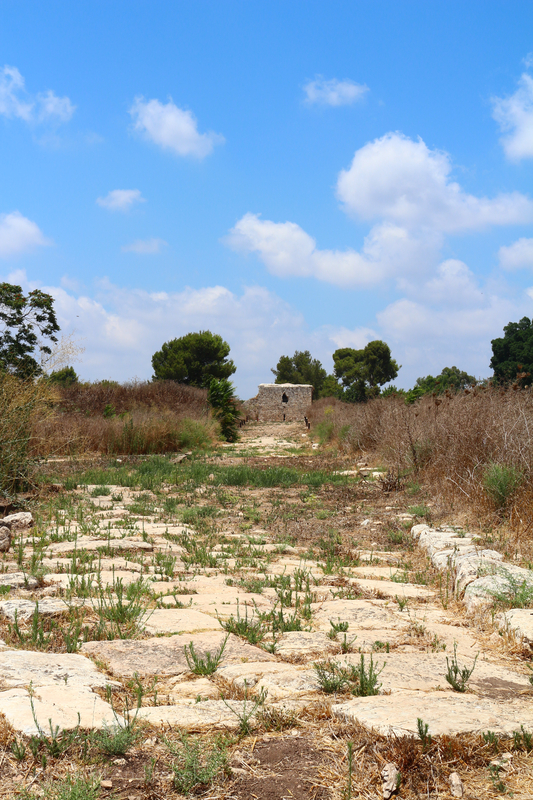 Located at the headwaters of the Yarkon River, Aphek sat on a strategic point where the coastal routes–including the Via Maris–were blocked by the Yarkon and its surrounding swampland, and funneled through a narrow pass towards Megiddo and the Jezreel Valley. Whoever controlled Aphek controlled the pass and any trade or armies moving through it. 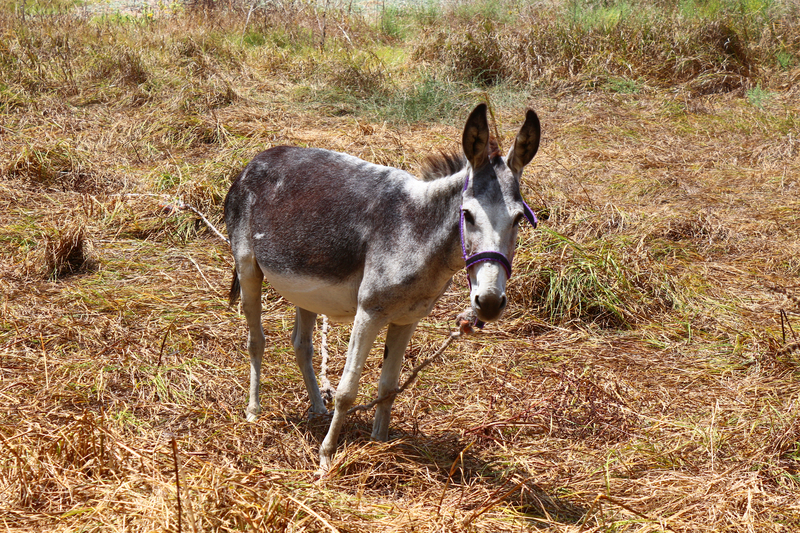 And, as a side note, the local donkey population at Tel Afek is also worth viewing. They are as curious about you as you are of them. 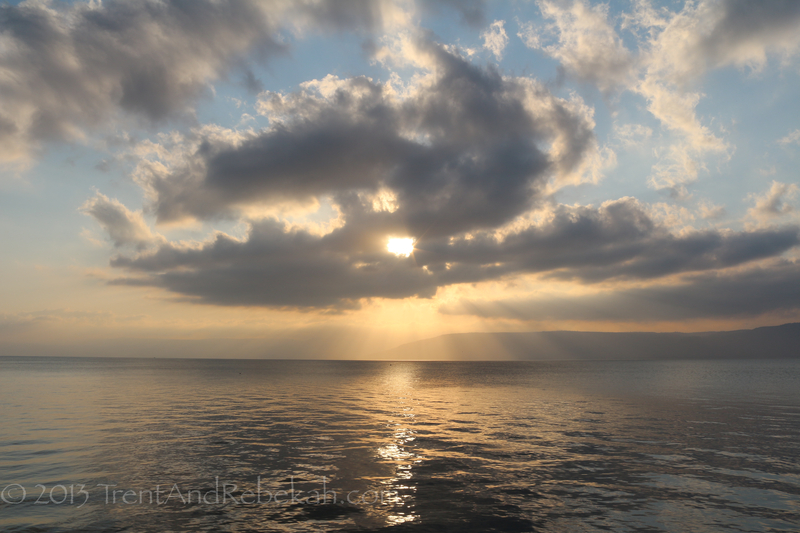 Here is the sun rising over the Sea of Galilee this morning, about 3 hours ago. It was a calm and peaceful scene, quite beautiful as well. 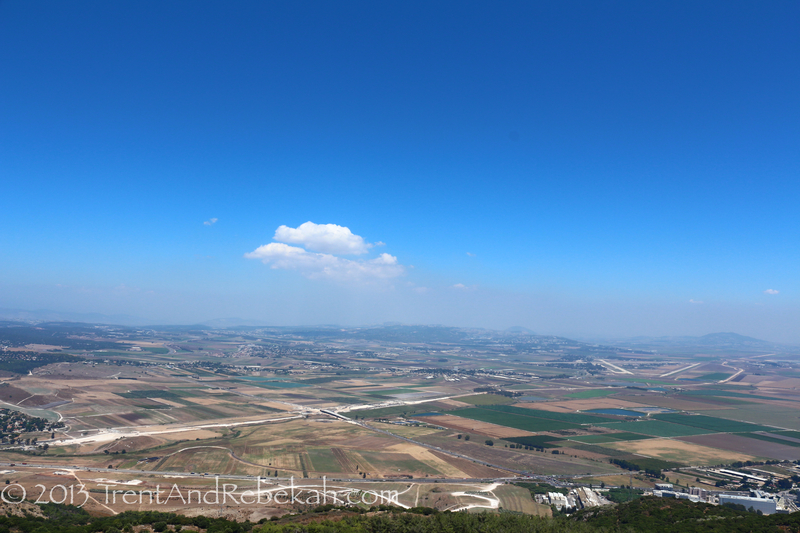 We’ve been traveling around the Galilee area for a day or two and are about to move into the Nazareth/Jezreel Valley area.